BILL TRAYLOR, born a slave in 1853, is today revered as a major American artist and is currently the subject of an extensive solo exhibition at the Smithsonian American Art Museum, Between Worlds: The Art of Bill Traylor (up through March 17, 2019). Betty Cuningham Gallery is pleased to present its second exhibition of the work of Bill Traylor, opening on Saturday, January 19th, 4 – 6 PM. On view will be 25 works, the majority of which are from the collection of The Charles E. and Eugenia C. Shannon Trust. 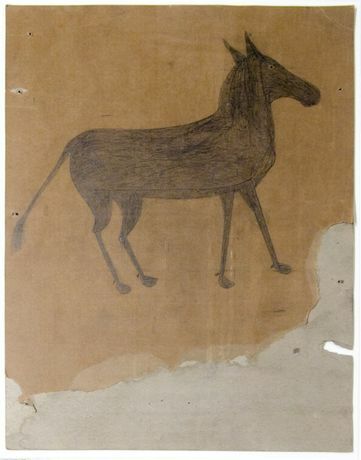 In 1939, Charles Shannon, a young artist, encountered the 85-year-old Bill Traylor, seated in front of a blacksmith shop, with a pencil in his hand, on Monroe Street in Montgomery, AL. Intrigued, Shannon provided Traylor with encouragement and art supplies. He purchased approximately 1200 works from Traylor, for modest prices, and these preserved works have become the basis of Traylor’s legacy today. Fascinated by the endless inventiveness and aesthetic beauty of Bill Traylor’s work, Charles Shannon organized Traylor’s first exhibition in 1940 at New South – an arts center in Montgomery founded by Shannon and others. Traylor’s next exhibition, and his first in New York, was at the Fieldston School in 1942. Bill Traylor’s work would not be shown again until 1979-80 at R. H. Oosterom Gallery in New York. Since 1980 there have been numerous exhibitions. Particularly noteworthy in museums are 1994 – 95 - Lively Times and Events: The Drawings of Bill Traylor, Montgomery Museum of Fine Arts, AL (and travelling); 1998-99 - Bill Traylor (1854 -1949) Deep Blue, Kunstmuseum, Bern, Switzerland and Museum Ludwig, Cologne, Germany (and travelling); 2013 - Bill Traylor, Drawings from the Collections of the High Museum of Art and the Montgomery Museum of Fine Arts, American Folk Art Museum, New York, NY (and travelling) and Traylor in Motion, Wonders from New York Collections, American Folk Art Museum, New York, NY; 2018 – Outliers and American Vanguard Art, National Gallery of Art, Washington, D.C (and travelling); and currently Between Worlds: The Art of Bill Traylor at the Smithsonian American Art Museum, Washington, DC. Today, Traylor’s work can be found in museums and public collections around the world. The current exhibition at Betty Cuningham Gallery will remain on view through Sunday, March 3rd, 2019.